Courage is not the absence of fear but the willingness to walk through your fear in pursuit of a goal that is important to you!Remember, on the other side of your fears is your fortune! My first meeting with my client, Melody, was a very interesting one – a picture of contradictions! Melody is a high potential individual contributor in a technology company. She is an ambitious young professional who was also an intern with the company six years ago. Needless to say, the company was her natural employer of choice after graduation. Her last six years with the organization have presented her with several exciting projects and opportunities for sure. 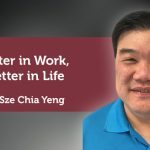 She was in a Customer Success function handling a specific aspect of Customer Success – change management where she helped clients embrace new technology and solutions and realize new value additions from them. She had requested her manager for a coach to discuss her career journey. She felt she was stagnating and wanted to deliberately steer her career with intention and ambition. However, she was drawing a blank in terms of how to go about this. Further, she was anxious and unsure she could handle any sort of change. At the same time, she was concerned she would grow increasingly restless and may even ultimately disengage! While she sought some sort of change, she was equally fearful of change and unsure of her personal ability to handle change. It was almost a perfect intervention for a timely coaching engagement and our sessions started with Melody being presented with three coaches for her to choose from. As a coach this made perfect sense as the success of a coaching engagement is highly dependent on the coach-coachee fit. What makes a good coach-coachee equation? Chemistry - this is essentially the trust space between the coach and coachee so the latter feels absolutely comfortable sharing very personal and confidential information with the coach and feeling she can give herself the fullest permission to share in confidence. In our first meeting, it was a quality dialogue between us on all of the above. A combination of questions, verbal and non-verbal communication all culminated in her selection of me as coach. We then worked on sealing an airtight coaching agreement so there was clarity in the engagement, confidentiality of all discussions, communication methods, mutual commitments, clarity of session progressions, including agenda, goals, action plans, and expected outcomes, roles and responsibilities. Peeling back the layers of the onion, through active listening coupled with effective questioning techniques, we effectively narrowed down to a specific agenda item and desired outcome at each session. Not surprisingly, each session started like a walk in the maze or navigating the web with multiple tabs open and links clicked, almost drowning in the plethora of data and information we got inundated with! Applying effective visualization techniques, Melody was able to close out the distracting “tabs”, till just ONE remained open each session… yes, the one that was most pressing! We then shut out the noise and focused on that singularly for the session. We had discussions around her career to-date and then moved to the future state, which she quickly understood is the way for her to progress forward. As Melody poured out narratives, she personally found it very helpful as I dished out some visuals and activities. They kept her focused on what mattered and further helped de-clutter her thoughts and conversation. Soon, she was looking forward to these types of interventions that she said provided her with clarity in thought. Where is she on passion and drive on her job, planning for her future role, professional networking for instance. Where she is NOW (current state), where she ASPIRES (FUTURE STATE), and the GAP or what is holding her back? By using the continuum, Melody was clearly able to articulate and see for herself her current state, desired end state, the direction she was wanting to move in and importantly the gap that she needed to address and specifically what was getting in her way or acting as BLOCKERS for all intents and purposes. We could then look at an action plan based actions she would own and execute within specific time frames with checks built into the model as checkpoints. So we further worked out detailed actions, timelines, accountability partners (to whom Melody would check in with at agreed intervals and ensure keystones and milestones are met as committed). Melody was enthused to try this technique whenever she describes a future state. To create a mental picture of how that may look? Imagery helped her describe the state, feelings, knock-on benefits, excitement, fears and more. This gave her additional outlets to express and for us jointly to get to the core of what needed to be addressed. Through deep active listening, probing questions and positive visualization, she could soon understand and accept the fact that she was in a comfort zone, needed to stretch herself, overcome her fear of change, take small baby steps in the forward direction (steps that she agreed were comfortable for her to take in that direction), take them with responsibility and accountability, land in a new comfort zone, look back and see for herself that the earlier zone was after all not as comfortable as she thought . Change would then become more comfortable. Keep on taking baby steps, looking back and actually feeling more comfortable in the new place…all the while moving to a desired future state! Melody was thrilled she could finally conquer her fear of change looking at change from this perspective and she embraced the technique to try a few changes along her journey. Celebrating the little successes along the way, and making stretching a habit made every forward move seem worthwhile to Melody. Next we used Career Maps to start seeing the opportunities ahead for her. It was like a mind map that she created at our session, looking at what she is passionate about, what parts of her job give her the “fire in the belly” feeling, what makes her stressed, bored, and disengaged. She was then clearly able to see a logical method to leverage her strengths and her passion while managing her weaknesses to drive a few possible career paths forward. 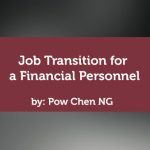 Not only a career path, she was also able to chart and clearly see multiple pathways that could potentially lead her to each option. 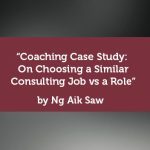 The coaching sessions gave Melody the chance to pause, reflect, visualize, map, have fun and at the same time, derive clarity in her pursuits to conquer fear, develop self confidence and at the same time, deliberately drive her career forward. 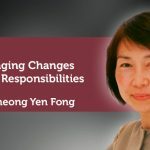 She also valued the life-long skill of successful change management which she now believed she could apply to all the changes in her life. Sustainable behavioural changes created a habit; habits drive personality and ultimately the destiny of individuals. Melody was no exception and she embraced this whole-heartedly and started seeing results over the medium to long-term.